Relax after your dinner and enjoy a stay in a modern hotel. 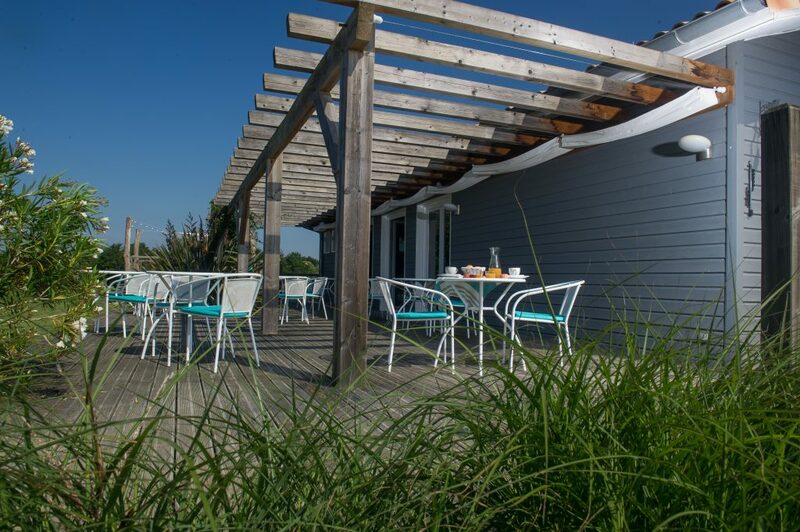 Hotel Lodge La Petite Couronne is directly opposite our restaurant. This is a small hotel with 11 spacious bedrooms, where you are assured of a personal welcome by the owners Nancy and Iwan van Es. Hotel Lodge La Petite Couronne was built in 2009. The building is made out of wood, for which we have chosen because of its natural and stylish appearance. The hotel is situated on an area of 4,95 acres. The construction concept is small-scale; there are 10 rooms in total on the ground floor and one storey. We have WiFi everywhere. Your room is large and is equipped with a private terrace or balcony. Thanks to the situation of the hotel, all rooms have a free view on the Chalosse hills. Room 11 or Lodge “La Cabane des canards” is located on a special place. 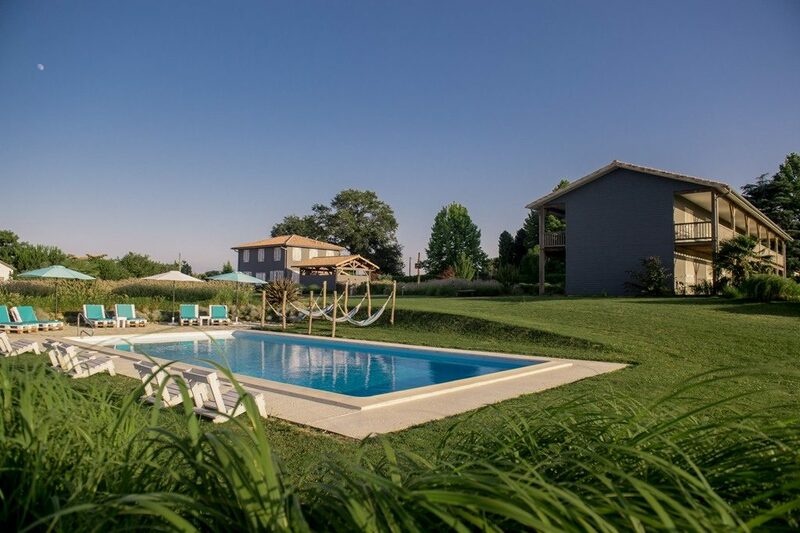 It is a quiet location behind a hedge of bamboo with a very nice view from your room and terrace over the hilly landscape of Landes Chalosse. Special that is our lodge for sure ! The construction is the same as we use for duckcabins in our region. Therefore his name the “The Duck Cabin”! Since 2010 our hotel has the European Ecolabel. 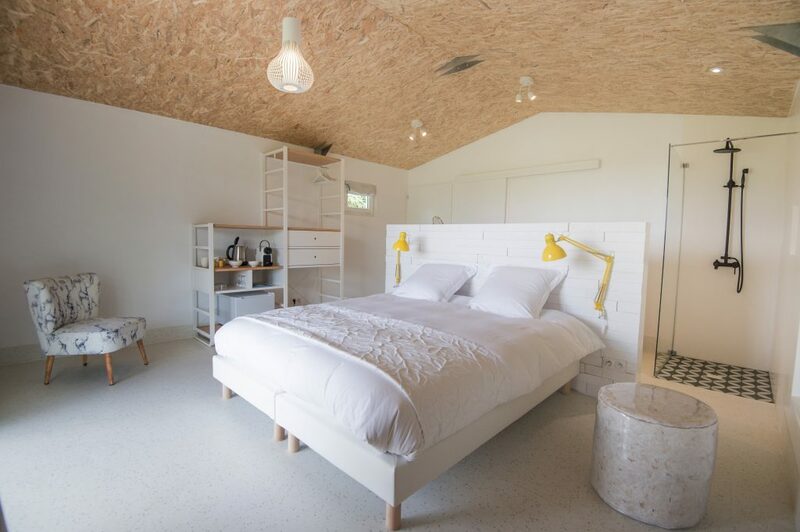 This label guarantees you a responsible, ecological holiday accommodation in France. We find it important to welcome disabled people in our hotel. Therefore we have room 3 at your disposal.This room has the same interior as the other rooms, except there is an extra bathroom, fully adapted to the wishes of disabled people. The trademark “Tourism & Disability” implement and enforce this right. Landes Chalosse is characterized by its hilly landscape and offers many touristic possibilities in terms of nature, culture, sports and gastronomy. Iwan and Nancy van Es love to welcome you! Double room with breakfast for two people: 92 – 110 euros.